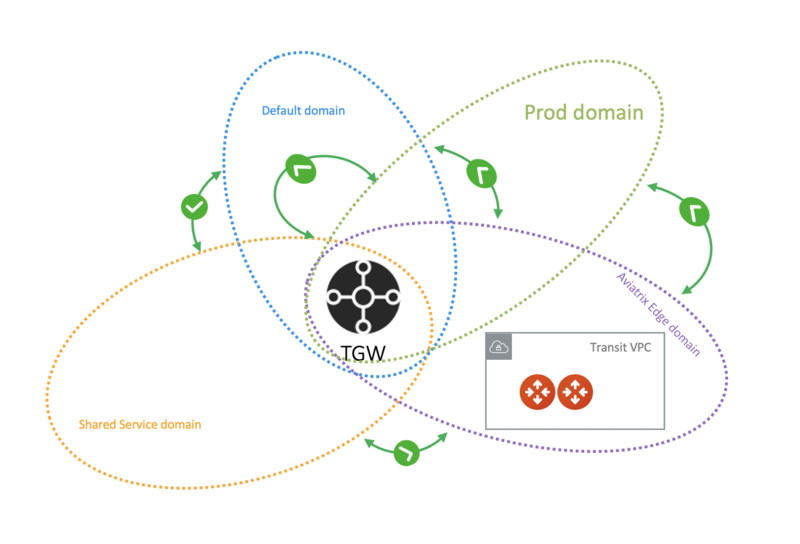 AWS Transit Gateway (TGW) Orchestrator Plan is the first stage in deploying a Next Gen Transit Network using AWS Transit Gateway. After you go through the Plan stage configuration, you can proceed to the Build stage to attach VPCs. For background information, refer to AWS Transit Gateway Orchestrator FAQ. Create AWS Transit Gateway. This is the only must do section in Plan before you start to Build (attach VPCs) and consists of Step 1. In this section, an AWS Transit Gateway and three connected Security Domains are created. Create Segmented Network. This is an optional section. It consists of Step 2 and Step 3. This section creates your own additional Security Domains and define Connection policies. This section is entirely modular and you can modify at any time. Create Hybrid, multi region or multi cloud Connection. This is an optional section. It consists of Step 4, Step 5 and Step 6. This section launches an Aviatrix Transit Gateway at the edge VPC, build hybrid connection to on-prem, other Aviatrix Transit gateway cluster, or deploy Transit DMZ . If you need hybrid connectivity, Step 4, 5 and 6 must all be executed and in sequence to complete this section. This section is entirely modular and you can modify at any time. In the planning stage, think about what network segmentation you need to achieve. For example, do you need to segment Dev/QA VPCs from your Prod VPCs, i.e., no connectivity is allowed between these VPCs in each group? The plan stage creates Transit Gateway and Transit Gateway route tables in AWS. There is no charge either by AWS or Aviatrix. If you have not decided on network segmentation, no worries, proceed to build a full mesh network by using the Default_Domain. You can modify your plan at any time. Simply return to the Plan page and create security domains and changing connection policies. Transit Gateway Orchestrator Plan workflow provides a step by step instruction to define and setup your policies. In order to use AWS Transit Gateway service, you must first create a AWS Transit Gateway. This step creates a AWS Transit Gateway in a specified region with a specified AWS account, the Aviatrix Controller also automatically creates the Default_Domain, the Shared_Service_Domain and the Aviatrix_Edge_Domain and the corresponding AWS Transit Gateway route tables. Note the three domains are connected, implying if you attach VPC to the Default Domain or Shared Service Domain, the VPCs can communicate with each other and can access on-prem through the Aviatrix Edge Domain. Account Name An Aviatrix account that corresponds to an IAM role or account in AWS. AWS Side AS Number Default AS number is 64512. This field currently is not used. After AWS Transit Gateway is created, you can validate by going to View page and see what has been created. This section includes step 2 & 3 to plan a segmented network. If you plan to build a default network (full mesh), skip this section. You can make changes to your network segmentation at any time, simply come back to this page. If you plan to build a segmented network, use this section to create a new Security Domain and setup connection policies. In the example below, a new domain called prod_domain is created. Security Domain Name Specify a unique domain name. For example, Dev_Domain. This step specifies the connection relationship of one domain to others. Two connected domains imply that VPCs in each domain can communicate with each other despite the fact that they are in different domains. Aviatrix Controller takes care of both VPC route table and AWS Transit Gateway route table programming and updates. Highlight a domain on the left panel and click Add, the domain will appear to the right. 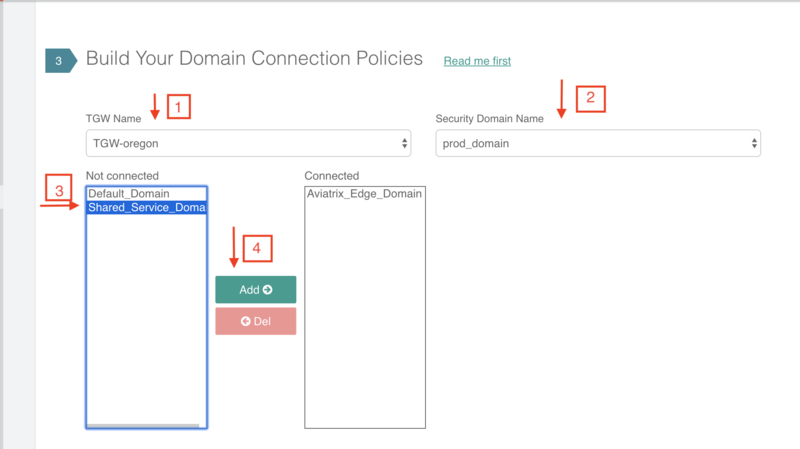 In the example shown below, the intention is to connect the newly created prod_domain in Step 2 to the Aviatrix_Edge_Domain so that VPCs in the prod_domain can communicate with on-prem servers and hosts. 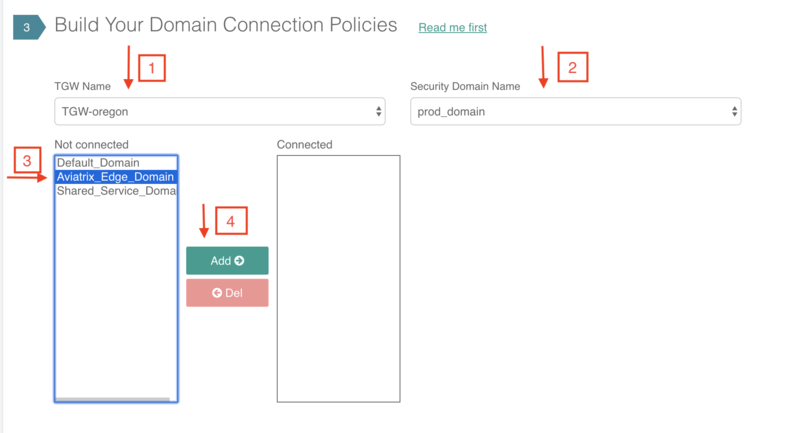 Continue from the above example, you can connect prod_domain to Shared_Service_Domain, as shown below. 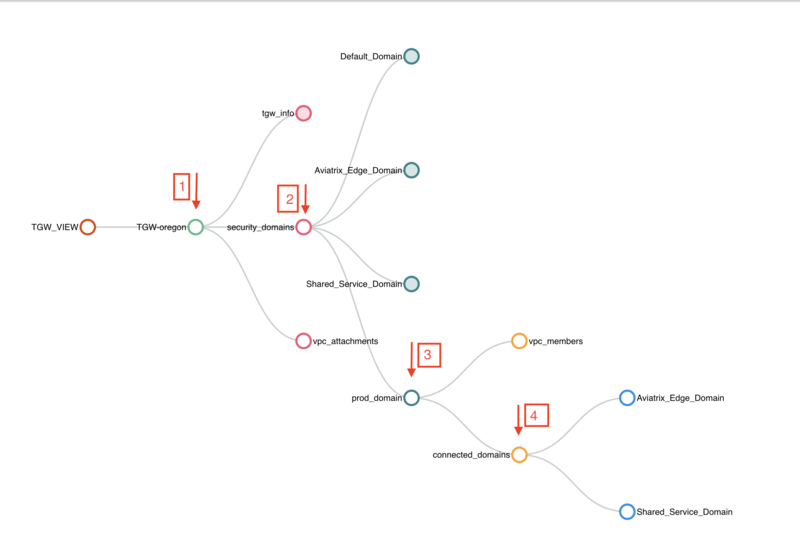 Click the View page under AWS Transit Gateway Orchestrator and click each expandable circles to see what has been created, as shown below. This section is for hybrid, multi region or multi cloud connection, it includes Step 4, 5 & 6. It sets up connection to on-prem datacenter over Direct Connect or Internet. If your deployment does not require on-prem connection or to another Transit gateway, skip this section. Later when the requirement changes, return to this section and start with Step 4 to setup. Create a new transit VPC at Useful Tools -> Create a VPC. Select the option “Aviatrix Transit VPC”. If you would like to continue to use your existing transit VPC and it is too small (not enough of /28 unused segments), use AWS Edit VPC CIDR feature to create a new /24 subnet for the Aviatrix Transit Gateway in TGW use case. Step 4.1 is to take a detour to setup Aviatrix Transit GW if you have not done so. Follow the the Transit Network workflow and complete Transit Network workflow Step 1, 2 and 3. 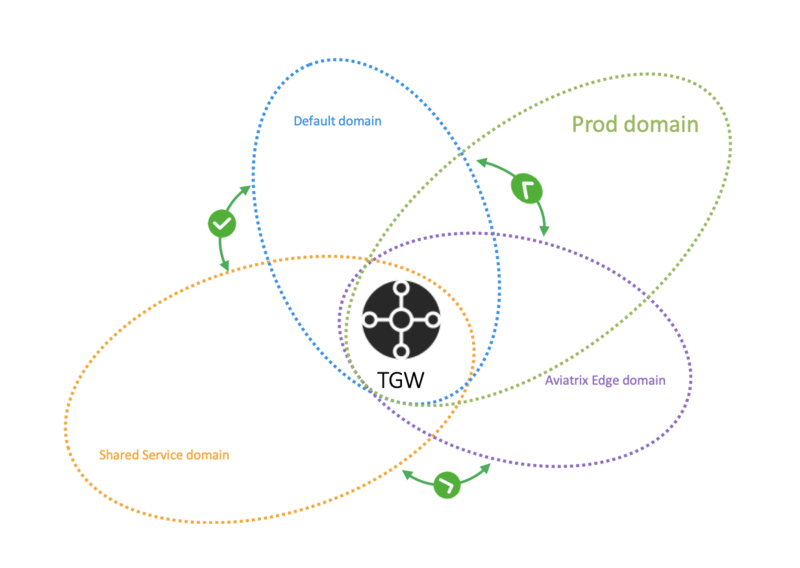 When complete, return to this section and continue to Step 5 in this workflow to Enable Aviatrix Transit GW for Hybrid Connection. If you plan to deploy Transit DMZ as shown below, follow the Transit DMZ workflow to launch the gateways and complete Transit DMZ workflow Step 1, Step 2 and Step 3. Step 4 can be setup at any time later. The Aviatrix Transit GW created in Step 4 does not build an IPSEC tunnel to AWS Transit Gateway. The networking between AWS Transit Gateway and the Aviatrix Transit GW is via the AWS VPC infrastructure. This step designates an Aviatrix Transit GW to be used in conjunction with AWS Transit Gateway. It creates a second Ethernet interface on the Aviatrix Transit GW for sending and receiving packets from AWS Transit Gateway. It also creates two subnets and two respective route tables in the edge VPC to route packets to and from AWS Transit Gateway. Account Name An Aviatrix account that corresponds to an IAM role or account in AWS. This account is for launching Transit gateway. It does not need to be the same account as AWS Transit Gateway creator. Gateway Namen Select a Transit GW from the drop down menu. This step attaches the Aviatrix Edge VPC to the AWS Transit Gateway and the Aviatrix Edge Domain, thus allowing the Aviatrix Transit GW to send and receive packets from AWS Transit Gateway. 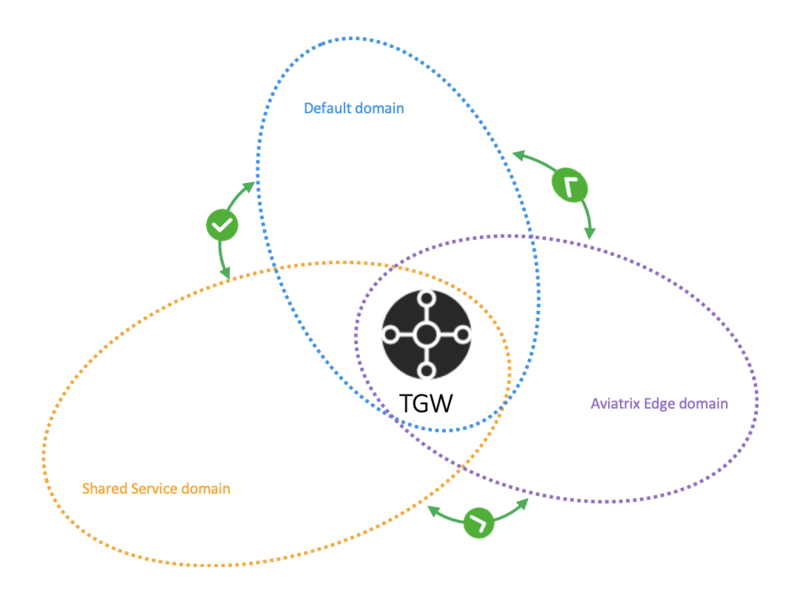 There is no IPSEC tunnel between AWS Transit Gateway and the Aviatrix Transit GW, the Aviatrix GW behaves as an EC2 instance in a Spoke VPC (The Aviatrix edge VPC) attached to the AWS Transit Gateway, as shown in the diagram below. Such setup allows Aviatrix edge VPC to leverage the high performance provided by AWS Transit Gateway. This section consists of delete functions. To delete an Aviatrix Transit GW attached to a AWS Transit Gateway, go through Step 7 and Step 8 listed below. Then go to Controller Gateway page to terminate the gateway instance. This step is the opposite of Step 6. This step deletes the eth1 interface and other resources associated with the Aviatrix Transit GW from AWS Transit Gateway Orchestrator. This step delete a security domain created in Step 2. This step delete the AWS Transit Gateway created in Step 1.